Daily Hydrating Eye Cream prevents signs of premature aging safely and naturally. Nurturing oils firm the delicate skin around the eyes while refining fine lines. Rose Water and other botanical extracts hydrate and soothe, leaving skin smooth, soft and resilient. Pineapple Extract smoothes the appearance of fine lines and wrinkles. Rose Water tones the delicate tissue around the eye. Fast-absorbing formula can be applied under makeup. Apply every morning after cleansing and toning/conditioning. Use approximately 1/4" of cream and gently press into skin around each eye. Begin at the inner corners and work out. Water (Aqua), Persea Gratissima (Avocado) Oil, Rosa Damascena Flower Water, Glycerin, Alcohol, Ananas Sativus (Pineapple) Fruit Extract, Althaea Officinalis Leaf Extract, Beeswax (Cera Alba), Calendula Officinalis Flower Extract, Arachis Hypogaea (Peanut) Oil, Hectorite, Prunus Amygdalus Dulcis (Sweet Almond) Oil, Rosa Damascena Flower Extract, Prunus Armeniaca (Apricot) Kernel Oil, Lysolecithin, Simmondsia Chinensis (Jojoba) Seed Oil, Macadamia Ternifolia Seed Oil, Mangifera Indica (Mango) Seed Butter, Butyrospermum Parkii (Shea) Butter, Hippophae Rhamnoides Fruit Oil, Chondrus Crispus Extract, Glyceryl Stearate, Stearic Acid, Xanthan Gum, Sodium Stearoyl Lactylate, Fragrance (Parfum), Geraniol*. 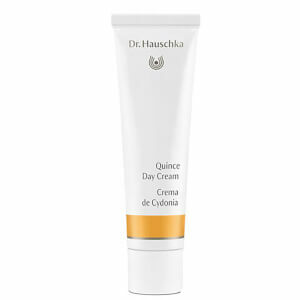 Dr. Hauschka Quince Day Cream 1 oz.